Dual-frequency Wi-Fi® and an Ethernet connector enable browser preview during shoots, in addition to FTP transfer to external servers, PCs or laptops. HD-SDI ports handle video with embedded audio and time code data for monitoring and recording of frame rates up to 30fps, and a new 3G-SDI port supports 1080p video at frame rates up to 60 fps. Time code I/O helps ensure frame-accurate sync during editing and post-production. The XF205 camcorder can also be used with Canon’s new RC-V100 Remote Controller to provide full access to important user functions, including start/stop, zoom/focus/iris, white balance and more. GetYour Canon XF205 HD Camcorder Here - Just $3,999. A versatile Canon 20x HD wide-angle video lens captures images with outstanding clarity across a broad 26.8–576 mm* zoom range. An eight-blade circular aperture provides natural and visually pleasing images. Three separate rings control focus, zoom and iris settings. A new Five-Axis Dynamic SuperRange OIS System dramatically reduces the image-degrading effects of camera shake, and a new rotating handgrip enables comfortable camera positioning at shooting angles from high to low. Check out this recent Government Video Magazine review of the Canon XF205 HD Camcorder. They said that the "The Canon XF205 HD camcorder is so over the videotape era that it gives you three slots for memory cards and supports two different kinds of memory. If that wasn’t enough—the XF205 is also a joy to use... 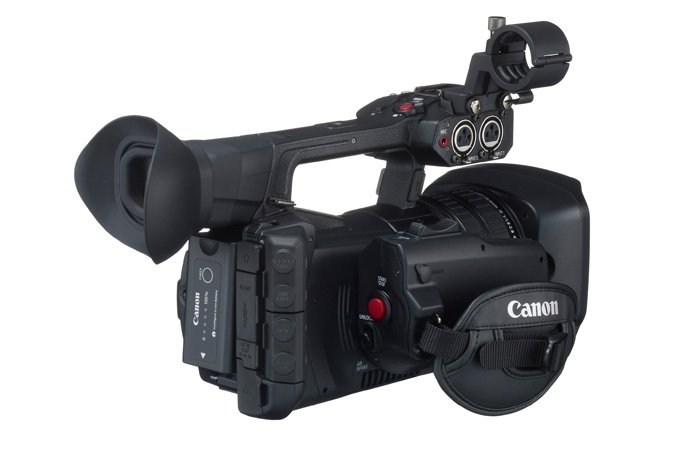 The Canon XF205 is an HD camcorder that can shoot 1080p/60 video at bitrates up to 50 Mbps, including full 4:2:2 quality. It is intended for professional applications, such as ENG, documentary production, commercial and entertainment video production, as well as corporate/government video projects. The amount of features packed into this camcorder is astonishing, and I was able to only scratch the surface of its capabilities during the pleasant two weeks I had with the unit...the Canon XF205 makes excellent video, easily holding its own for ENG, commercial and industrial shooting. What really stands out on this camera is its lovely lens—this is one non-removable lens that never made me wish I could swap it with something else. Couple the lens with a nicely capable imaging system and every manner of connection and control you might desire, and the Canon XF205 works out to be a fine product at a reasonable price. Join Jem Schofield as he takes us through the features and benefits of the XF200 and XF205 video cameras. Learn about features they offer, from the functionality of the camera body to tools for creating images. The camera records MPEG-2 at frame rates of 23.98/29.97p and 59.94i at up to 50Mbps, with 4:2:2 color sampling, to integrated CF card slots using an MXF wrapper that is compatible with most popular NLE systems. You can also record to an integrated SDXC card slot using the MP4 codec at frame rates up to 59.94P. The XF205 features 4-channels of audio with manual/automatic record levels with two XLR inputs and a built-in on camera microphone. The built-in hand grip features 120° of rotation, making it easier to find a comfortable shooting position. Built-in dual-band WiFi allows you to control the cameras functions from available mobile devices as well as view footage from the camera on the devices. Proxy files can be transferred via WiFi while you are shooting new footage. The camera also incorporates an Ethernet connection, so you can transfer files directly from the camera. An HDMI output provides you with video out. The lens features three infinitely rotating rings for focus, zoom, and iris. The rings use an electronic coupling to move the lens functions but maintains a mechanically linked feel during use. The XF205 offers optical image stabilization (OIS) useful for reducing image blur in a wide variety of shooting situations. It also utilizes electronic image stabilization (EIS) in conjunction with the OIS providing 5-Axis image stabilization. The 3.5" Organic Light-Emitting Diode (OLED) display provides vivid color and 1.23MP resolution. The viewscreen has a viewing angle of over 80 degrees in all directions, which allows you to see a usable image even when you are off angle to the viewscreen. The Color EVF is a 0.45 inch with 1.23MP of resolution and tilts up to 45° to accommodate different shooting positions. Dual-band Wi-Fi (5GHz and 2.4GHz) support is built into the camera, allowing FTP file transfer of MP4 video. The camera supports a web browser interface that combined with Wi-Fi support allows you to control key features of the camera, including start/stop recording, zoom (limited to three speeds), exposure functions, and focus using a smart phone or tablet. You can also view and download recorded MP4 footage from the camera on a PC or mobile device while continuing to shoot.